Before the advent of Version 3 of the software, masks were always template based objects - a mask was applied to an image hole or holes on any template. Version 3 allows the user to add a mask directly to an image. This has a couple of advantages. When importing images via a text file (see Importing Images via a text file), it is possible to set the mask for each image when importing the text file. Consider the following text file where several images are being imported per subject. The field names are ID, firstname, lastname, grade, image filename and pose respectively. Note the use of the full path for each mask (in UNC format in this example). The mask will also be found if it is located in one of these alternative locations meaning only the mask file name is needed, not the path. The text file is imported as per normal via Details Mode>Subjects>Import text file. The screen grab below shows the import text file setup. 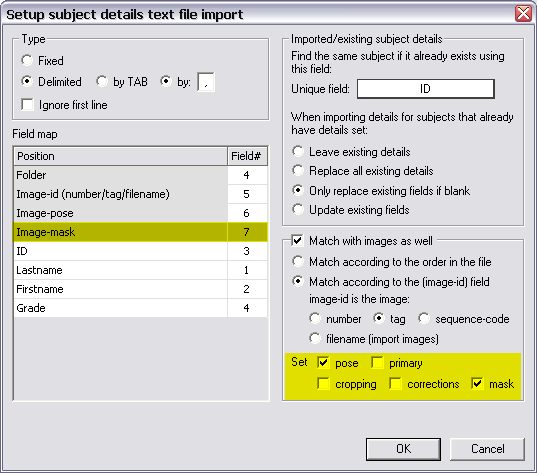 To import the images ensure the "filename (import images)" option is selected in the "Match with images as well" section. This will present an additional field to map - the Image-id field. In the example above the image-id field is field 5. To map the mask field ensure the Set>mask option is checked. This will present an additional field to map, the Image-mask field. In the example above the image mask is field 5. Once a mask has been applied to an image via a text file it can be turned on or off or changed in Images Mode as detailed above.